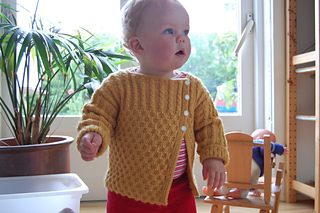 Honeypie is a classic and cute babysweater suitable for both girls and boys. The main gull pattern allude to the shape of honeycomb, thus the name… The size on the picture is 6 – 12 months. Instructions are given for sizes 6-12 months and 12-18 months. 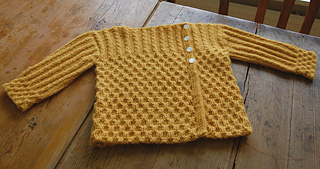 The sweater is worked from the bottom and upwards. The sleeves are worked according to the “seamless set-in sleeve” approach. There are no seams on the project. 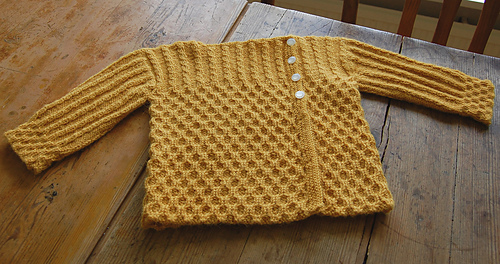 I should think it fits well for the intermediate knitter who’s not afraid of cable-knitting, applied i-cord lining, knitting around with five needles (for sleeves) and short-rows. There is no increasing or decreasing in body nor sleeves.